The cost of a National Lottery Lotto ticket has doubled to £2. The rise, the first since the lottery started in 1994, is part of a package of changes including bigger prizes, says operator Camelot. Prizes for matching three numbers will rise from £10 to £25. Average jackpots are predicted to rise to around £5m on Saturdays and £2.5m on Wednesdays. Media captionWould you be willing to pay £2 for a Lotto ticket? Camelot says this will mean more money for charities. It has raised £30bn for "good causes" since 1994. It says sales of the flagship Lotto game have been steadily declining for several years - impacting the money the game raises for the charities - so leaving Lotto as it was "was not an option". Some other prizes will be reduced. 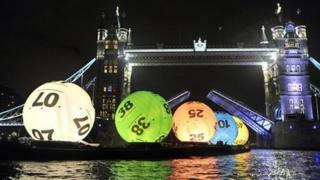 Camelot estimates that the reward for matching five balls plus the bonus ball will average £50,000 instead of £100,000. The prize for matching five balls is expected to average £1,000 instead of £1,500, while the average for matching four balls is expected to go up from £60 to £100. Extra numbers printed on lottery players' tickets will be entered for a raffle with prizes of £20,000. Camelot UK managing director Andy Duncan told the BBC's Today Programme the main objective of the changes was to "re-energise Lotto". "The prizes haven't changed for 19 years and this is a way of actually giving players more opportunities to win more money," he said. He said the National Lottery had grown by 50% over the last 10 years, with games like Euromillions and scratch cards adding to the portfolio. About 50% of the population play the National Lottery once a month, he added. Professor Ian Walker of Lancaster's Department of Economics told the BBC people had been "falling out of love with Lotto since the mid 1990s". Ticket sales used to be at about 80 or 90 million a week, but are now about 45 or 50 million week, he said. The real value of Lotto sales had fallen by more than 60% over the last 15 or 16 years and "Lotto had needed fixing for a while," he added. He also said the £2 price was bound to have an impact on ticket sales. Total National Lottery sales have increased by 35% since 2002, when the game was officially renamed Lotto. Some 30 million tickets are reportedly bought every Saturday. An average 800,000 players win prizes for matching three or four numbers each week, while around 800 players match five numbers or five plus the bonus, according to Camelot. Camelot is holding two £10m jackpot draws to mark the launch of the new game. The special draws, to be held on 5 October and 12 October, will also see 1,000 raffle ticket-holders winning £20,000 on each occasion.